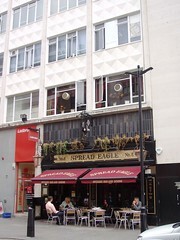 A chain pub just off Oxford Street, opposite Debenham's and near the top of New Bond Street. However unpromising it may seem from the outside, with identikit Spirit Group chain pub appearance in an ugly modern building, and however inauspicious the location (serving one of the busiest parts of Oxford Street, just by three of the largest department stores, and at the top of Bond St, technically in Mayfair), this is actually a pretty decent pub. It may be dark inside, but the decor is traditional and attractively kept, bar staff are friendly, and it's not too busy, at least at lunchtimes (undoubtedly it gets as busy and unpleasant as anywhere else in the West End after work). Downstairs there's a few high tables with stools opposite the bar, and then a step up to a carpeted area at the rear, with attractive etched mirrors at the rear of the pub, and leather banquette seating around the side. This space seats around 20 people at a variety of tables. There's also a fireplace (which wasn't going on Ewan's early summer visit). Upstairs is another room (bookable for functions), with another 8-10 tables and getting more light from windows overlooking the street below. There are three additional tables on the street itself, with shelter. There are three handpulls on the bar, with London Pride (£1.50/half pint), Well's Bombardier, and Young's ordinary, all apparently regulars. A few premium lagers are also available (Leffe, Staropramen, etc.). There's a food menu, standard stuff for the most part, though the salad bowl Ewan had was actually very decent quality (£5.35, but available with chicken at an extra £1.50 cost), salad leaves, cucumber and tomatoes, served with small warm potatoes on top, a very light dressing, and some small slices of baguette, with four good chunks of mozzarella laid on top photo. There's a large TV screen (in a frame) at the back of the ground floor, but there was no sound from it on Ewan's Tuesday lunchtime visit, and soul music was playing at a very reasonable volume in the background. Last visited by Ewan, 19 May 2009. Opening hours taken from website, November 2011. Last edited 2013-05-10 08:05:18 (version 6; diff). List all versions. Page last edited 2013-05-10 08:05:18 (version 6).